On Tuesday, June 5 the Cosmosphere will be holding a public observation of the Transit of Venus. Unless by some miracle you will still be alive in the year 2117, this is your last opportunity to observe this rare astronomical event. Just like Earth and the other planets, Venus is held in a continual orbit around the Sun by its immense gravity. Because Venus is inside Earth’s orbit, the planet passes between Earth and the Sun as it zips ahead of us on the fast track. From our point of view it usually passes a little below or a little above the Sun and this is due to the slight inclination of Venus’ orbit compared to ours. During most years, Venus would be invisible to Earthlings during the passage, because of the blinding Sun. But on rare occasions, Venus, Earth and the Sun line up so that Venus actually crosses the Sun’s face. With a solar-filtered telescope, Venus is visible as a black disc, taking about 6 hours to cross the Sun. Like clockwork, these transits of Venus occur in pairs 8 years apart separated by 121.5 years and 105.5 years. The first was predicted and observed by Jeremiah Horrocks in the year 1639. 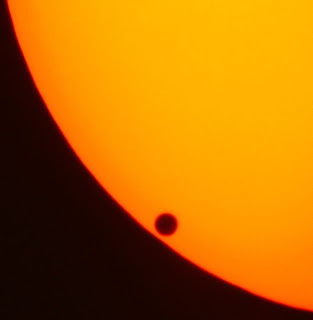 Horrocks used a telescope to safely project the first ever visual observation of a Venus transit. Transits also occurred in the years 1761, 1769, 1874, and 1882. The last one occurred in the year 2004, completing the transit pairing for this century. From 5:15 pm to around 7:30 pm (or whenever we lose the sun behind the western trees) Cosmosphere educators will be set up with solar-filtered telescopes in the parking lot across the street south of the building (old Hutch Floral lot) to provide a free public observation of this rare event. Of course, any observation of the sky hinges on the ever-changing Kansas weather, so as always we hope for clear skies. And we hope you will join us!